Those of you old enough to have watched television in the 1980s may remember James Burke, host and driving force behind my all-time favorite science documentary series, Connections. In each episode, Burke would start with some scientific advancement, show how it led to other changes (in science, industry, or society), which would in turn lead to another development…and the show would wind up with something that most of us would not have connected to the initial “But for…” cause. While I lay no claim to Burke’s erudition and elegance of thought, I’ve noticed that some of my posts here tend to mimic the Connections structure, usually by accident…but here’s one with a bit of design as well. Well, if you had founded a U.S. cab company in 1949 instead of 2009, my guess is that you wouldn’t have used a word from the title of the German national anthem. Too soon? By 2009, evidently not…so that takes care of my knee-jerk reaction to “Uber”. But what about Lyft? It has the advantage of being a homonym for a common English word, related directly to the service you’re providing…so what can go wrong? Another reason my initial reaction to “Lyft” as better than “Uber” may be some personal history. I worked for a number of years at an outfit that had used the same substitution of “y” for “i” to create its company name. It was the computer service bureau, Tymshare. Pretty straightforward, right? You want to rent time on a computer…you think Tymshare. Not so fast…there was a woman in my mother’s circle of acquaintances who knew that I was involved with computers, and worked for Tymshare. I found out that she had gone for years assuming that I was an internal IT guy at a company that rented out vacation condos! And finally, that Jungian, you-just-can’t-make-this-stuff-up coincidence…I never had the pleasure of meeting him in person, but there was a fellow Tymshare employee, a computer engineer with a reputation for brilliance…some folks rated him as (against stiff competition) the smartest guy at this Silicon Valley tech firm. His name? LaRoyTymes. 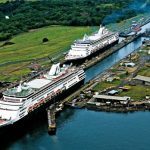 DISCLAIMER: This posting is by Greg Marus, an independent freelance writer and does not necessarily reflect the official position of Brighter Naming with regards to name styles or popularity. For example, Uber and Lyft have gone on to trigger a whole new direction and awareness in names styles in addition to transport business opportunities. Unique names always win in the long term. Descriptive generics, not so often. Let’s start this post with a Brighter Naming PSA: give blood! Both Athol and I are blood donors, and occasionally run into each other when the bloodmobile shows up. In addition to just doing a good deed, there are other benefits to donating blood. Depending on time and location, you may get various discount coupons, or T-shirts…but one benefit you always get is a “mini-physical”. To determine whether or not you’re in good enough health to donate, the medical staff runs a quick check on four vital signs. If you’re OK on all four, then you donate. If not…depending on what test you failed, and how badly, you can take appropriate action, ranging from “going home and getting some rest” to “sitting quietly until the ambulance arrives”. The one time I was prevented from giving blood was because I was just barely below (12.9 where the cutoff was 13) on the test for iron in my blood. Now, a slight iron deficiency is easily correctable by a few tweaks in diet, so I made sure I passed on my next visit…by the simple expedient of heating up a can of spinach for my side dish for dinner on the evening prior. Eventually, this gets around to naming. 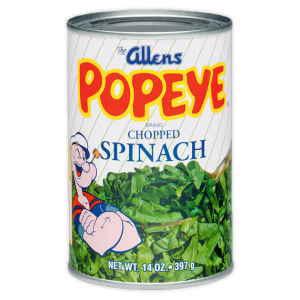 As I was enjoying my can of Popeye brand spinach I got to wondering: how many products are there named after cartoon characters? As I reflected, this question became more complicated. There are (as far as I can tell) not a lot of such products. However, there is a strong flow in the other direction: products that come first, and then become strongly associated with the cartoon character created specifically for promotional purposes. The ones that first spring to mind are associated with breakfast cereals, because the cartoons in the ads so often appear on Saturday morning cartoon (what else?) shows. In the following, I will refer to a cartoon character created for a product and appearing in some form of (usually animated) advertisement as a “cartoon mascot”. A further breakdown of this genre can be done along the lines of the spectrum of eponymy. Cap’n Crunch () and Count Chocula are the names of both the cereals and the characters created to promote them. At the other end of the spectrum, we have Kellogg’s Sugar Frosted Flakes, and what may well be the best-known cartoon mascot, Tony the Tiger …whose name is altogether different from the product. Interestingly, there are intermediate cases. In one example (familiar to all our older readers, but likely unknown to younger ones), the product name serves as a family name, while the character also has a given name: Speedy Alka-Seltzer. 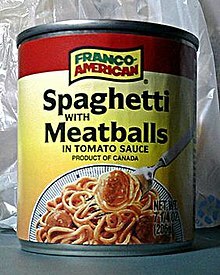 Other cases aren’t quite like this, with the product name serving as an identifier, but not exactly as a family last name. Examples here are the Michelin Man and the Keebler Elves. 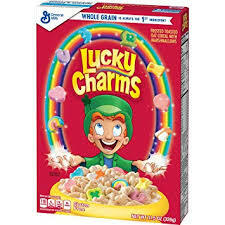 And, for those whose appetite for annoying stage Irishmen is insufficiently sated by the Irish Spring soap commercials…we present the Lucky Charms Leprechaun.Of course, those with a classical education will have identified the Trix Rabbit as a modern-day Tantalus. But bac k to the original question: what are the other products named after cartoon characters (rather than the other way around)? We invite readers to add to our list, which is very short. The only two I can come up with are Flintstones Vitamins and Donald Duck orange juice. What they have in common is that they are all ingestible…although one is food, one a drink, and the third a supplement. Where they differ is in their relation to the original source material. As an American born in 1950, I’m familiar with all of these cartoon characters in one (and often more) of their original media appearances. (For the record, cartoon characters may appear in one or more of the following: movie theater shorts; full-length movies; television shows; comic books; newspaper comic strips; and animated and print advertising.) Now, there may exist a Popeye cartoon short which doesn’t climax with Popeye regaining near-magical powers by ingesting a can of spinach…but I can’t recall seeing one. 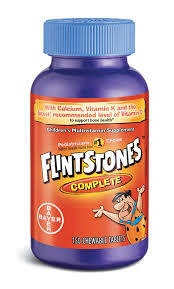 By contrast, I can’t think of anything in the Flintstones TV show or Donald Duck animation or comic books that ties the characters to vitamin supplements or orange juice. and “A Name Is Not A Brand. CAUTION: The names used in this article are all registered trademarks of their respective owners or licensees. Some even have super brand status which gives them across the board trademark protection. Many of these have been licensed. You cannot simply name your product after a famous cartoon character without first licensing it from the characters current owner. But if you come up with some great character for your video game, app, movie or other software product, then maybe you can license it to some big consumer products company to put on their cereal boxes, shirts, hats, games, toys, etc. Remember 3 Angry Birds, one of the first popular games on mobile phones? Though the magic of licensing you can buy toy birds in their likeness, as well as many other products that play on these images and themes. Remember The Rocky movies? The original author made almost no money on the movie rights themselves, but luckily his lawyer persuaded him to retain the character rights. So he gets a cut on every one of those Rocky fighting toys that are still popular today. There are companies that specialize in helping you license your ideas and designs worldwide, as well as ensuring compliance and protection. See them all at one of the International Licensing Expo Fairs. And, most recently in the post “’NomenEst Omen?’ Uh, Not Always…” ( ) I wrote about the Takvorian family, who, for reasons that still elude me, sell their excellent Middle Eastern food items (dolmas, tabbouleh salad) under the brand name “Haig’s”. It occurred to me that there is really nothing inherently wrong with using either the Haig or Takvorian family name as a brand name…except for the ludicrous ethnic mismatch. Is this a whole sub-category of the brand name that’s so bad it’s good? And more recently, I came upon an item in a Grocery Outlet weekly ad for…Ji Hao buttermilk biscuits. On investigation, this turns out to be even stranger than it sounds at first. Ji Hao happens to be a brand line of Asian Foods which is in turn part of Sysco, the outfit known mostly for providing food and restaurant supplies to restaurants, hotels, nursing homes, etc. Meanwhile, back at the buttermilk ranch…most of the line of Ji Hao products seem to match up reasonably well with the name: rice, cooking oil, imported canned fruits and vegetables…and then there’s Ji Hao cream cheese. To go on your jalapeño bagel at Carlos Goldstein’s? PS “Sysco” seems to me to be also a sort of mismatch; the name has nothing to do with food or restaurants, and looks and sounds like someone was aiming for the most generic tech company name available, and was disappointed that “Unisys” had already been taken. In today’s world, competition for customers has become increasingly fierce throughout all industries.Branding is the key to differentiating your company from your competition. All good brands are built through the regular delivery of their brand promise. It is this consistency that builds trust with the consumer and lays the foundation for their support and promotion. As such, it is incredibly important your brand image remains consistent across all channels, including website, app, and social media platforms. Naming companies, such as Brighter Naming, are here to help your business maintain and elevate its image so as to keep more customers and secure new leads. According to the eCommerce Foundation, 88% of consumers will research a product before deciding to make a purchase. This behavior highlights the importance of a website for today’s companies. With this being said, you can use your website to demonstrate your brand’s voice and mission and gain potential leads. Remember, your website is the hub for all of your content and your products, so it is vital for your company to have a professional website. Your website establishes your company brand for other channels, so it must demonstrate the strength ofyour brand voice. In addition, your website is where consumers go to reference your brand, so its content must establish a clear and consistent mission. With more than 3 billion active social media users worldwide, it is important your company recognizes the enormous potential social media offers to reach your target audience. There are numerous platforms to reach consumers, such as Facebook, Instagram, Twitter, and Snapchat. Though each of your social media channels should have a distinct voice, given the scope of what each platform has to offer, it is important to maintain your brand message across each. For example, Wendy’s launched a social media campaign on Twitter that generates interest by using sarcasm, sass, and jokes. Still, the company keeps their website professional with clear images and information about their food. A consistent brand message is what keeps your customers loyal and willing to refer you to potential customers. To maintain your brand image on social media, your company should be sure to share updates in short form and include a lot of visuals. Short updates are easy to read and remember, and strong visuals keep users intrigued. In addition to generating engagement through updates, it is also important for your business to use social media as a means of monitoring what consumers are saying and the question they have about your company. Listening on social media or “social listening” is how you are able to gain important market insight directly from consumers. Social media can boost customer engagement and provide an alternative customer service channel. Still, you must maintain your brand across each platform to ensure validity and trust. With an app, both Android and iOS users have constant access to your company. Apps remain within constant reach of a user as smart devices have become a standard in the US. You should create a design persona, representative of your company and incorporate your brand traits into the app. In this way, consumers will be able to recognize your brand upon download. In addition, developing a voice that resonates with your audience is another important tool in designing an engaging brand voice. The secret to effective in-app communication is creating a tone that feels natural to your audience. MailChimp defined their brand voice in set terms and then incorporated it into their mobile app. When using the app, users are immediately confronted with the MailChimp brand and can recognize they are using the company’s app versus any other. Apps provide a unique way to stay within constant reach of your users. Using push notifications and personalized messaging, maintain your brand voice and increase consumer interest. Overall, it is important for your company to keep your brand consistent across all channels. You can accomplish this by representing your unique brand on your website, maintaining your brand image on social media platforms, and developing your own distinguished app voice. Growing and expanding your brand will ensure your company stands out from its competition and creates a positive lasting impression on your regular and potential customers. For a long time I have wondered how Mail Chimp grew so big so quickly, despite some formidable competitors like Constant Contact, Vertical Response or emailforce.io. The more I looked at it the more it seemed to me they did nothing different, except perhaps a more intense focus on direct mail campaigns rather than also doing list management. But that wasn’t enough – so I concluded it was their catchy name that had caught so many people’s attention. Certainly it cut through the noise of the boring descriptive names and brought a smile to the faces of all who bothered to think about the name. Ironically Mail Chimp themselves have been trying to change their image, without actually changing their name (except now it is one word). So the chimp icon has a different expression on his face which only employees can tell you about, and the rest of the graphics shows hand drawn birds in flight or opening mail or … Pity they didn’t use flying chimps instead, or are they working their way towards being MailBird? Sorry no. Mailbird.com already has over 100K users. Well I still think Mail Chimp is a 3 star name, even if it is starting to box them in a corner. But I bet most of their loyal customers don’t even bother to think that they are so much more than the mail part of their name. And why shouldn’t we have names that bring a smile to our faces, even at work? Many years ago I started my first iteration of Name of the Week when I learned that search engines wanted fresh content regularly to maintain your SEO score. And this was long before blogging and social media existed, let alone had become household words. My partner at the time, and to some extent me too, was afraid we would run out of names to rate and write about so she asked me to prepare 25 names at least before we went live. How naive we were. Here we are 20 years later and I don’t think we will ever run out of names, however long I live. In an amusing side note, at one stage Siskel & Ebert came after us for using the Thumbs Up rating, similar to they did for movie ratings. We were flattered that they even noticed, but of course we were quick to change our symbols. Care to suggest some for this go around? In the interim, we often blogged about names here, or did a slightly more formal rating of a name while writing as The Name Critic. This will continue to evolve at its own pace and readers are invited to submit fairly well known names for free, public analysis. But what better way to revive Name of the Week than to discuss Hello Sunshine. This is the name of Reese Witherspoon’s own production company. As if I wasn’t charmed enough already by Miss Legally Blonde herself, now I want to reach out and give her an extra big hug just for selecting such a cool name. What a positive name for everyone to work with or for. What a great message to put on the credits of every movie they make. What a great way to attract scripts and people you want to work with. What a great way to cut through the noise of all other media or movie production companies. Hello Sunshine definitely rates 3 stars. Find them online at https://hello-sunshine.com/ and see their simple but unique logo that goes with this company name. 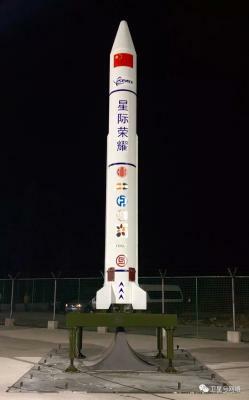 You just have to smile when you are reading a Business Week article about rocket launches and China’s catch up efforts when you discover one of their startups is called Beijing Interstellar Glory Space Technology Co. Also known as i-Space, I notice the author did not try to use the actual Chinese name for the company: Xingji Rongyao. And you thought your company had an identity problem! In the same week this article appeared, there was also online news about Interstellar Technology losing a rocket soon after launch. But that was the Japanese company with the similar name – no Glory for them, but they are crowd funded and probably will now have to return to their patrons for some more handouts. With all this Asian activity, makes me wonder how I will feel when we learn and see pictures of Chinese astronauts running around on “our” moon. Will they have their own names for the areas and craters? PS Do chopsticks work in zero gravity? Sometimes you come across a name that is so simple and elegant you just have to ask why didn’t I think of that? And how the heck was the reg TM still available? And you won’t get a better example than this fairly new flavored water drink called Hint. In this age of increasing popularity of bottled water drinks, having one that so eloquently can imply a hint of lemon or a hint of lime is surely a home run for branding. Of course, a brand is a lot more than just the name. It is the promise of an experience. So in this case, the drink has to stand up to lots of taste tests. Unfortunately, I am not so sure it will. Yet I see they have been around for at least 12 years so they must be doing something right with their fruit flavorings. Hint® is a registered trademark of Hint Inc from San Francisco, California. It has been a few months since I made my long road cross country trip so I have had time to cool off and consider my position on the logo and image makeover of the Best Western chain of lodges. But my opinion hasn’t changed. What were they thinking to take such a stapl e, colorful logo, and throw it out and start all over again with their own Corporate Branding? Where is the continuity. Maybe more importantly, where is the connection to the old image? You know, the warm colorful one. Now they are just another corporate button. Yes they are a growing chain and extending the brand in all directions. Sure they want more upscale city properties but why risk their history and loyal following in resort areas across the country. Giving up such a leadership position to try and chase Hyatt Regency is what it looks like to me. Did they not ever really talk to some of their guests and see the loyalty to the brand as they traveled across the country? What now? Will he say they go from Corporate BW button to button? 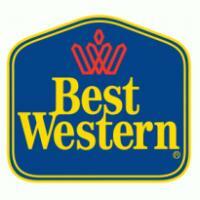 In these examples the words Best Western are still prominent, but not so on all the lodgings. Just a shiny BW button. Looks so unfriendly and out of place in the countryside. And through me for a loop when sometimes it was blue and sometimes red until I figured out red stood for Plus. Plus what I have no idea – just a scam to get franchisees to shoot more upscale I think, just like Airbnb Plus. Heck they should have done it in black and white and said that BW now meant Black and White. 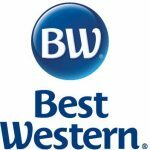 PS I see BWP stands for Best Western Premier and not their more popular Best Western Plus. Go figure!